Heat gas or charcoal grill. In small bowl, mix cheesy butter ingredients until blended. Refrigerate until serving time. Pierce potatoes to allow steam to escape. Brush outside of potatoes with melted butter; sprinkle with seasoned salt. 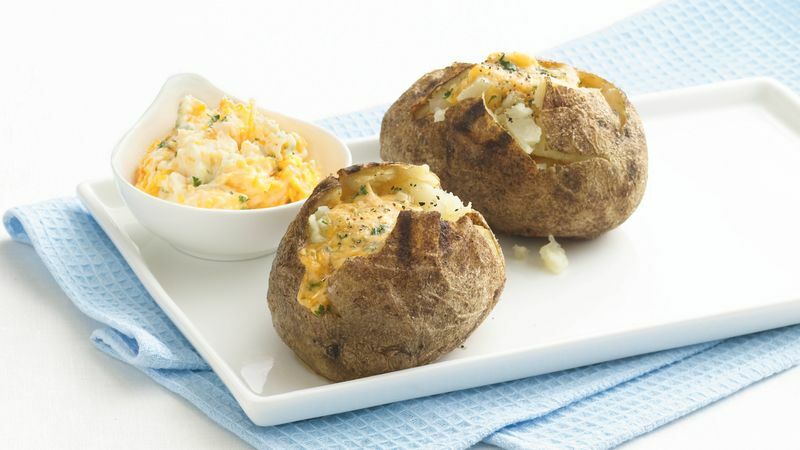 Place potatoes on microwavable plate or in shallow microwavable dish. Microwave on High 6 to 8 minutes, turning once, until fork-tender. Place potatoes on grill over medium heat. Cover grill; cook 8 to 12 minutes, turning occasionally, until crisp and browned. Cut large X in top of each baked potato; press sides slightly to fluff. Top each with cheesy butter; sprinkle with garlic-pepper blend. Use any cheese that you like to make these easy potatoes. Why not try Cheddar, Colby, Swiss or a combination of mozzarella and Parmesan cheeses?